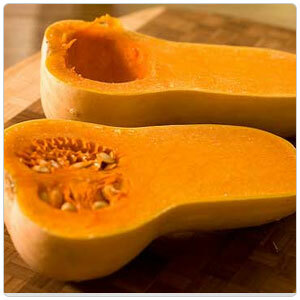 Its sweet, nutty, orange flesh has a familiar pumpkin flavor and creamy texture. Its tan, smooth skin should be peeled away. Having a relatively small seed cavity, Butternut yields more flesh that other winter squash. Can be roasted, sautéed, baked, mashed and fried. Good in tempura, sautés, soups, purees and gratins.